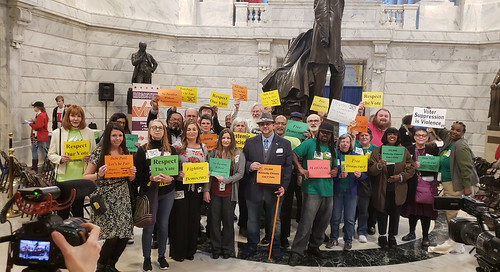 Anyone who has followed the progress of Senate Bill 100, which attacked ordinary Kentuckians’ access to rooftop solar during the 2019 General Assembly, knows that this legislative session, monopoly utilities were determined to have their way. While rooftop solar may have taken a hit this past legislative session, solar continues to be a viable and growing industry in the state. Join solar advocates, installers and everyday Kentuckians to learn more about solar energy's bright future here. We'll have music, workshops, food and more! Fun for the whole family. Today's Rally for Voting Rights in Frankfort was a strong combination – THIRTY organizational cosponsors, FOURTEEN people with felonies in their past telling their stories under the capitol dome, SIX media outlets covering the event, about 175 attendees, and with all that we built a lot of momentum and awareness for our fight for Voting Rights.